This part of the Newscoop manual is aimed at TagesWoche editors and journalists working their way through these three steps. Theme design is covered in the companion manual The Newscoop 4 Cookbook, available from Sourcefabric. 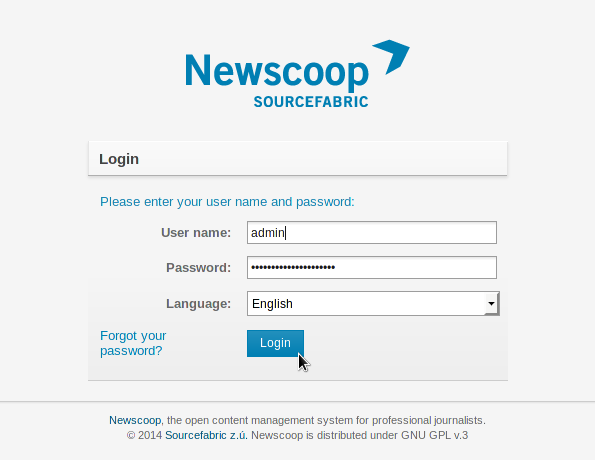 The first step begins with logging in to the administration interface of your Newscoop server. This is a special interface which is only available to the staff of your publication. Readers who have accounts with your online publication will log in using the home page of your website instead. Below the User name: and Password: fields, click the drop-down menu to select an interface Language. Then click the Login button. If you have previously logged in using a different Language, your browser will have saved a cookie to remember your preference. 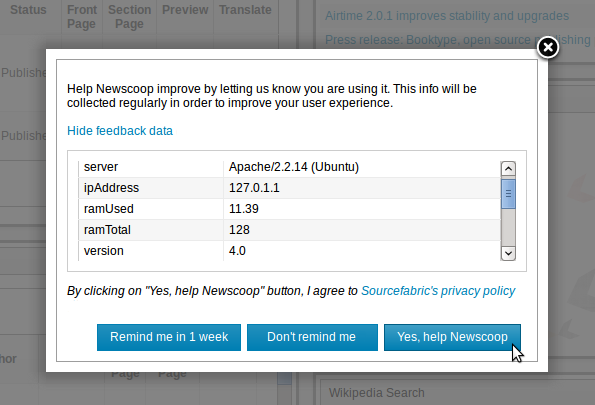 If your browser does not allow you to switch languages, you may need to delete this cookie. Please refer to the documentation for your web browser for details of how to do this. In Mozilla Firefox, for example, you can delete cookies by clicking Preferences, then Privacy, then Clear your recent history on the main menu.